I’ve often heard that details are what makes a home so special and after seeing this gorgeous home I’m convinced! 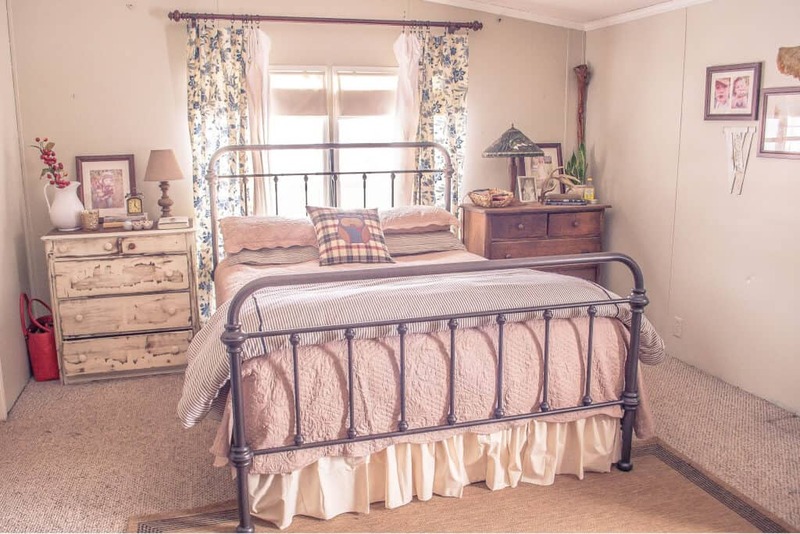 This 2000 model double wide is beautifully decorated and has a ton of country cottage manufactured home decorating ideas. 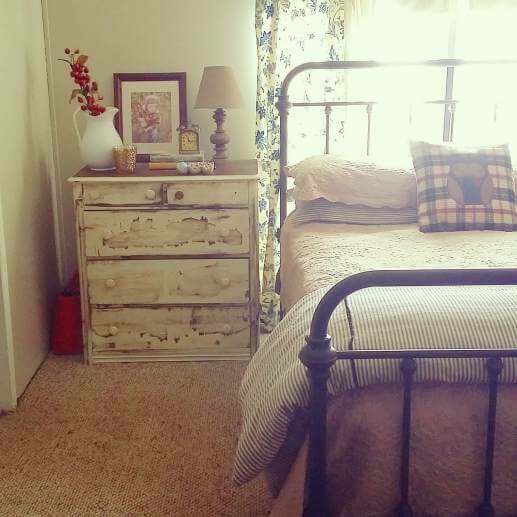 It reminds me of a storybook cottage with its rustic, natural tones and rich, warm textures. 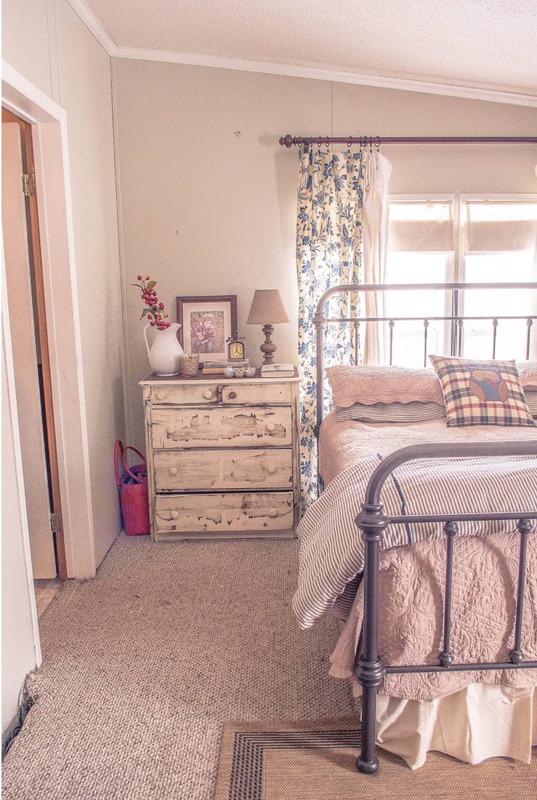 Get Plenty of Country Cottage Manufactured Home Decorating ideas From This Home! Chantal and her husband Joe, of Marathon NY, have lived in their manufactured home since 2005. 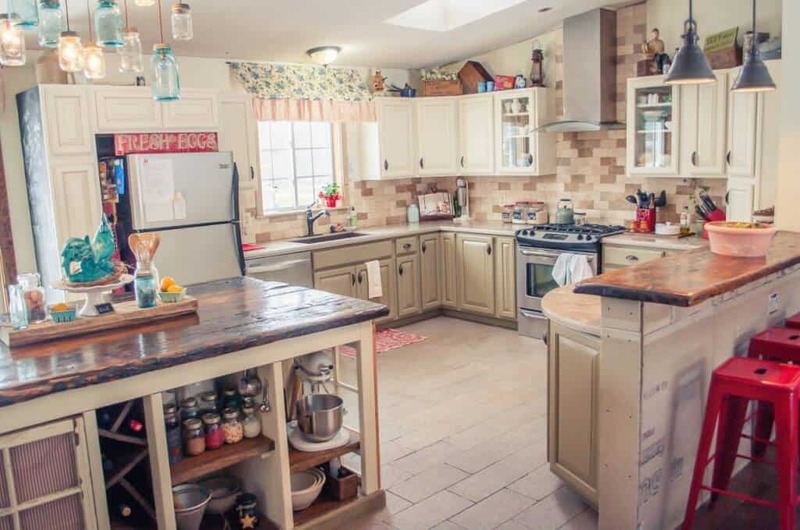 It sits on 11 acres and has 1960 square feet of beautifully decorated space. Initially, the couple had no intention of making this property their forever home. They bought it as a starter home because they wanted to start a family and get away from the hassles of renting. Now, 10 years later they have no intentions of leaving! 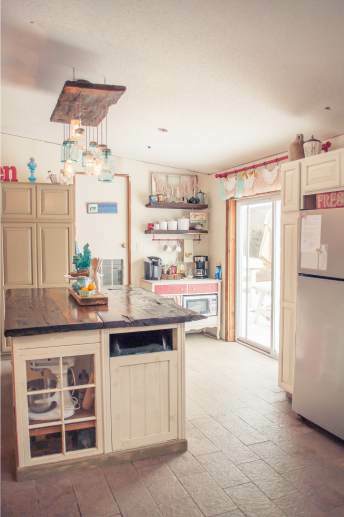 The couple quickly fell in love with their quaint little town and grew attached to their home. 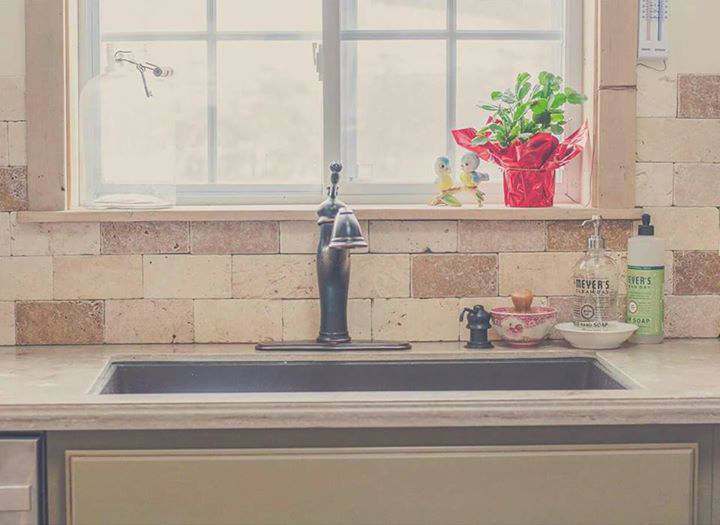 Once the decision was made to stay, they began renovating the kitchen. The builder’s grade cabinetry had to go! 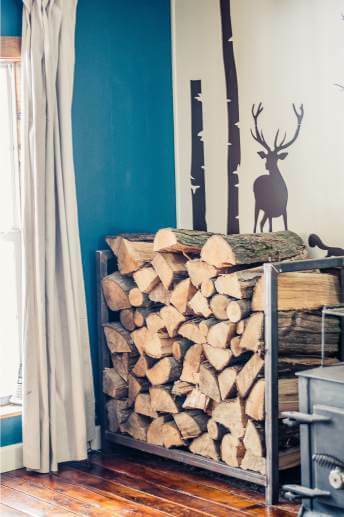 Related: Tips for Decorating Your Manufactured Home With Natural Elements. Chantal and Joe redesigned the kitchen’s layout and installed cabinets and a center island that they built themselves. They also replaced the flooring, countertops, and backsplash. After the kitchen was finished, they began on the dining and living rooms. Joe has more than 10 years experience in construction so they were able to update the entire home by themselves. Though Chantal admits it wasn’t easy, she estimates that they were able to save more than $30,000 in labor costs by doing the remodel themselves. 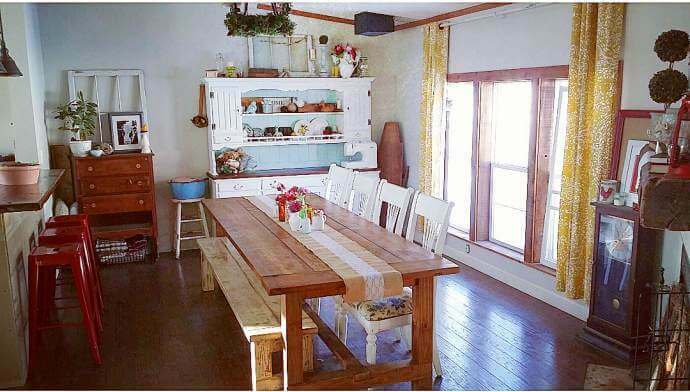 They also saved money by tearing down an old barn and reusing the wood as flooring, trim, and shelving. Their living room floor is covered in the barn wood. The rest of the wood made it onto various surfaces around the house such as the island counter top and breakfast bar. They made smaller shelving out of the smaller scraps of wood. 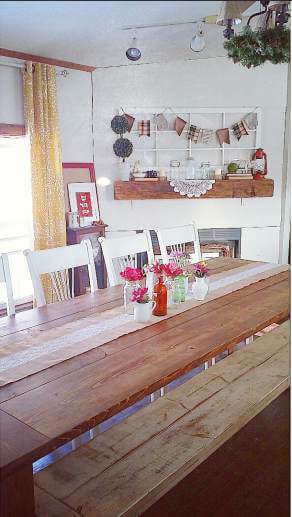 The dining room carries on the vintage shabby chic vibe. 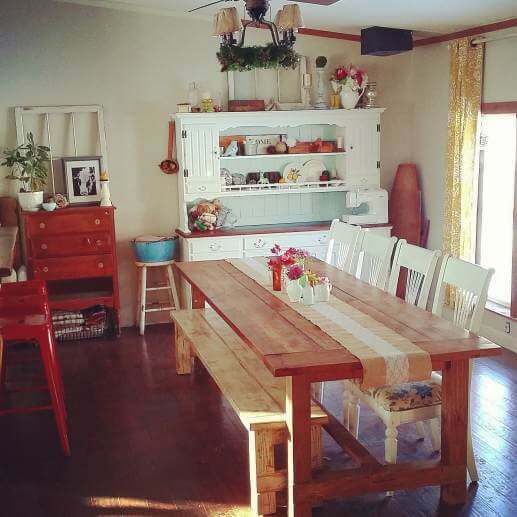 The crafty couple built their dining table out of new wood and then stained it. 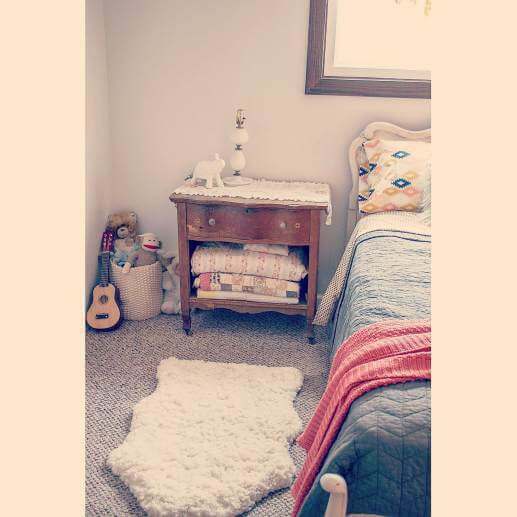 They were able to build the large table and both benches for less than $160!Chantal found the hutch on Craigslist and updated it to match the other elements in the room. 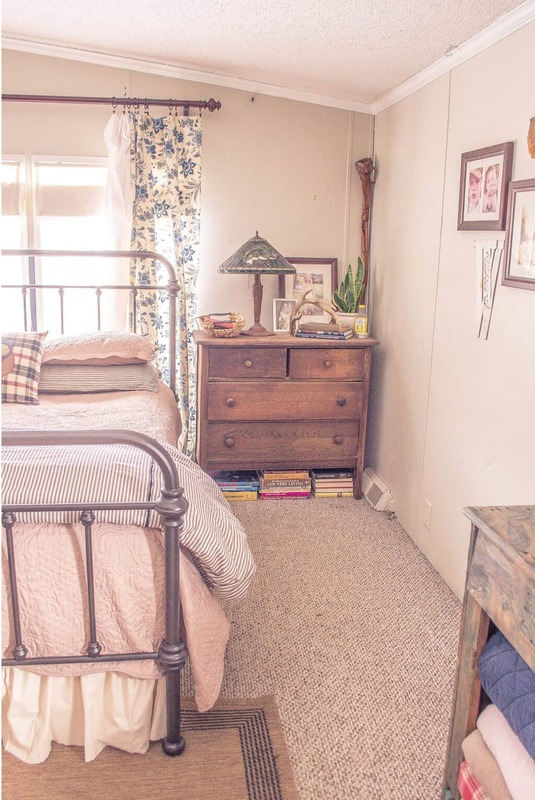 The living room in Chantal’s home continues with more stylish country cottage manufactured home decorating ideas. 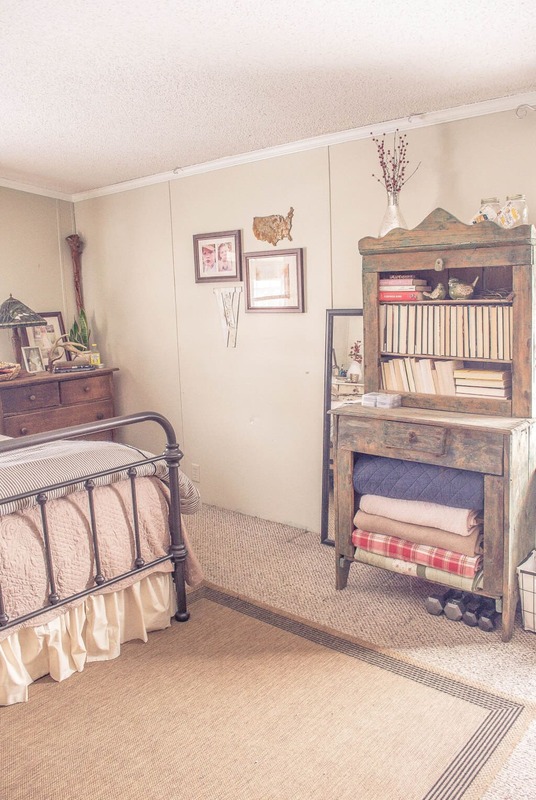 She manages to create a vintage vibe with a mix of beautiful patina and unique antique items. Chantal surrounds herself with beautiful things! Even the family pet is gorgeous, what a majestic animal! The barn-wood flooring and natural elements in the living room are more great country cottage manufactured home decorating ideas. Inviting, relaxing, and peaceful. The is a bedroom made for subtle dreaming! Natural fibers paired with muted elegance creates a perfect space to recharge. 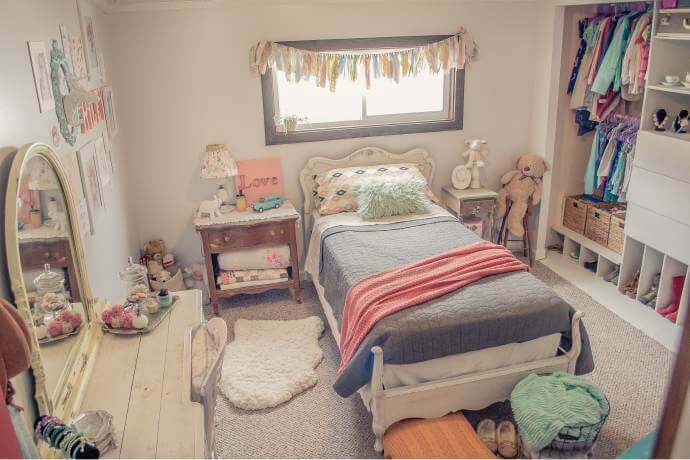 Their daughter’s room was recently updated. 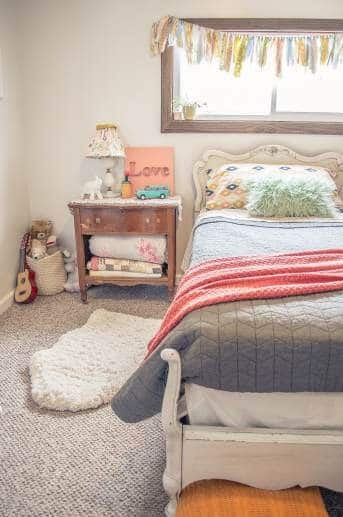 It looks like a room straight out of the pages of an Anthropologie catalog! 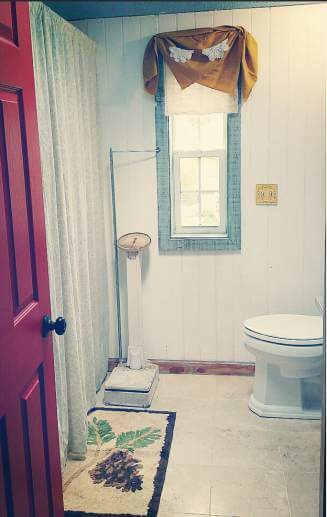 The bathroom carries on the primitive country cottage decor. Even the laundry room got an update! Of course, the exterior of the home got an update too! The family built a 32′ x 24′ foot deck off the kitchen last year. 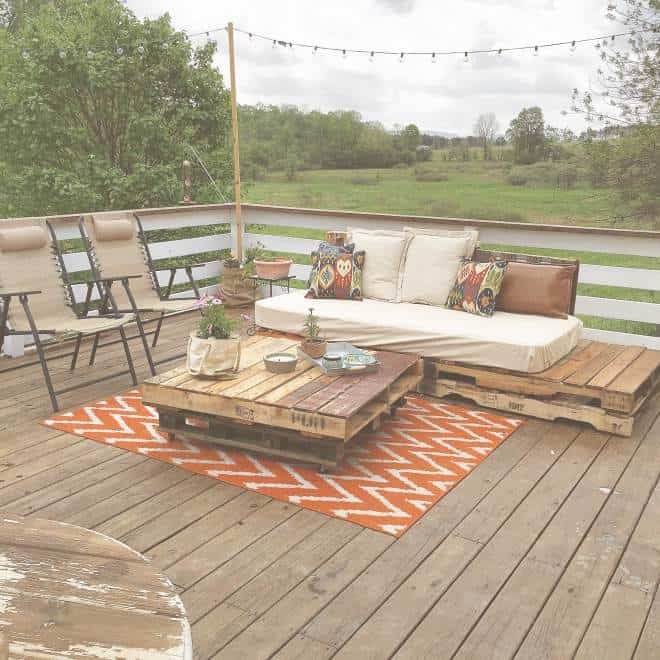 Chantal quickly made the space her own by adding custom seating and outdoor decor. 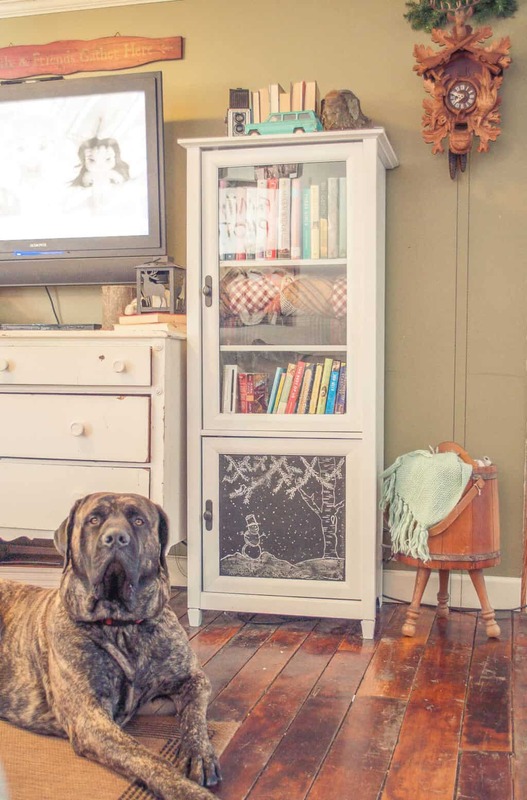 There’s no denying Chantal’s talent for home decor! It’s not easy taking the ‘factory look’ out of a factory-built home but Chantel has definitely done it! Chantal put her decorating skills to use with on a colorful camper makeover you can see here. 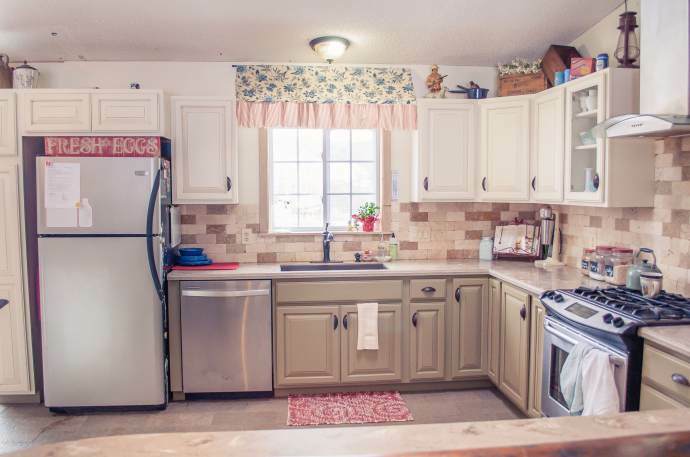 This home is another wonderful example of the endless potential that manufactured homes have. Thank you, Chantal, for letting me share your gorgeous home and giving us a ton of great country cottage manufactured home decorating ideas. It’s a true inspiration and a masterpiece of a home! This home is just beautiful. My husband and I are considering a manufactured home and this really helps. To see such a warm inviting space and know that it costs a fraction of a stick built home makes the decision easier. We are looking for land right now in NH and will keep you posted if we do go this route. Love your blog! A manufactured home is a great choice for many people! Let me know what you chose! We lived in a coach, for 11 years then moved to a Modular when our sons began to outgrow it. 2 years ago we sold our home and have been RVing. 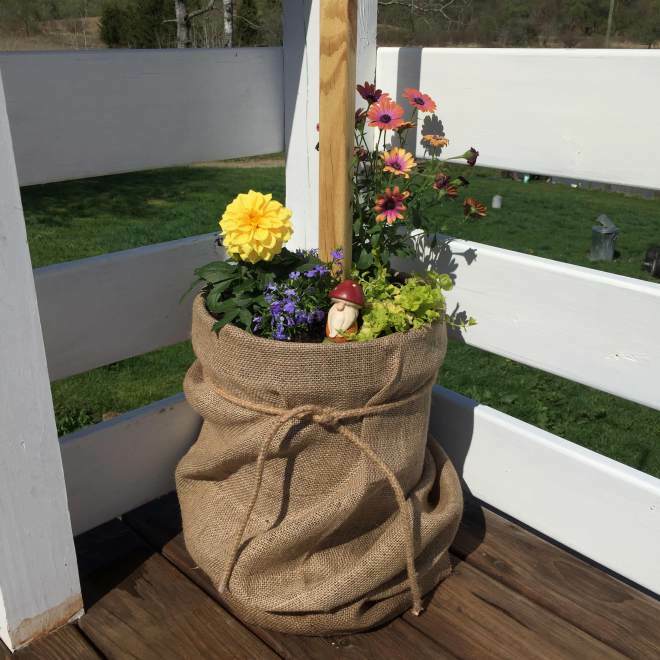 We, now are ready to think about finding a small one to re-do and had so much fun looking at your pictures. I’m so excited to make one into a new home with life again. And honestly, they are so much easier than a stick frame. Hi Jacqueline! Sounds like you are living the good life! Would love to feature your next project! I love this style! I only wish that I can do this to my mobile home. It’s simple beautiful and refreshing but with a down home sweetness. That gorgeous dog is just awesome in the photo, a great add to your photos. Best of luck! Let me know if you have any concerns! Really late to this party. What a lovely makeover. Everything looks so warm and comfortable. 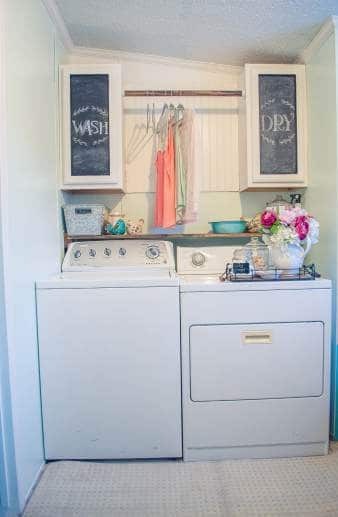 Love the shelf in the laundry room. What a difference this would make. Think I might have to steal this one from you. Your home is filled with so much love. Thank you for sharing this with all of us. 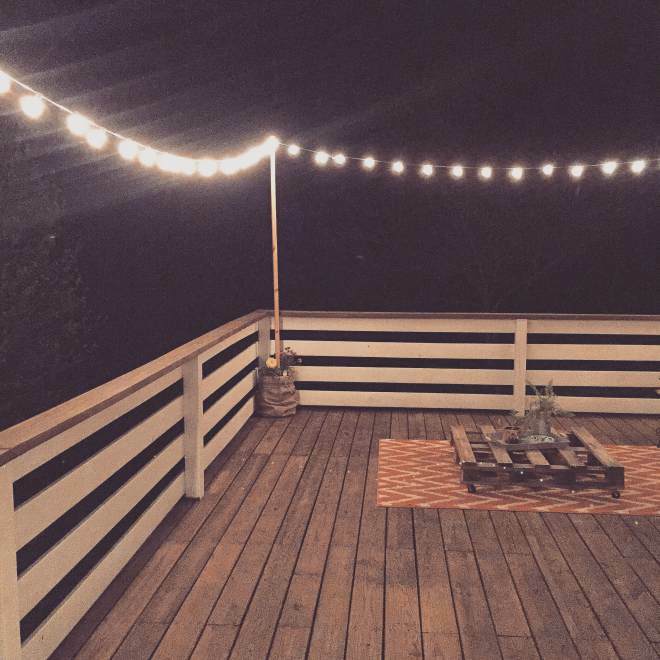 I also love the lights o the deck and the pallet furniture. Chantal, I am so curious where this home is. I live in the same small town as you do. Imagine my surprise when I randomly came across this story! We have done the same thing, turned a double wide into a real home. Ours is more rustic cabin than bright cottage. But I love what you’ve done. It’s gorgeous. The homeowners did a wonderful job of renovating their home and making it their own. 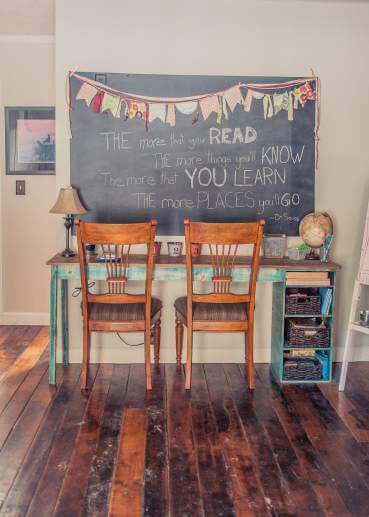 I love the recycled barn board used and no worrying about scrapes or dings since the floor has built in patina and wear. I also like the way they installed the railing on the deck. Running the boards horizontally would make painting so much easy than pickets. It’s great to hear from you! I hope you’re doing well! So happy to see more Upstate NYers making their manufactured home such a cozy, lovely place to be. I thought about you when I found out she was in NY! I have concluded that all y’all NY ladies sure know how to make a manufactured home look great! Always great to hear from you! Thanks for stopping by! Wow, they did a great job with the kitchen!